The work of Gabriele Schlesselmann, a Berlin, Germany artist, embodies figurative, abstract compositions, and cityscapes. Her paintings relate to the emotions and perceptions of the viewer, without influencing his or her interpretation. The painter answers the questions of the beholder with neither true or false. Narratives are extrapolated from the viewer's inner being, and so can transfigure or alter the content, when the painting is revisited at a later moment in time. Schlesselmann's figures, some clearly articulated, some only suggested, often without dimension, with little or no perspective and structure, with color as expression of emotion, inspire in the viewer, what is otherwise painterly intangible. She or he "sees" love, longing, intimacy, distance, joy, pain, separation, abandonment, loneliness, conflict, reconciliation.... Do the viewers "see" these emotions, or are these emotions awakened within the very being of the beholder, even as the viewer "sees" Schlesselmann's paintings? This is Gabriele Schlesselmann's definitive aesthetic gift. In the same spirit, scriptural elements. in her paintings, remain open. Occasionally, she inscribes texts, poetry in her paintings, which she then blurs, rendering the message inscrutable, so that the viewer is given sufficient emotional space, allowing the imagination to engage the viewer's own sensibilities. The work, a mural, "Warten. 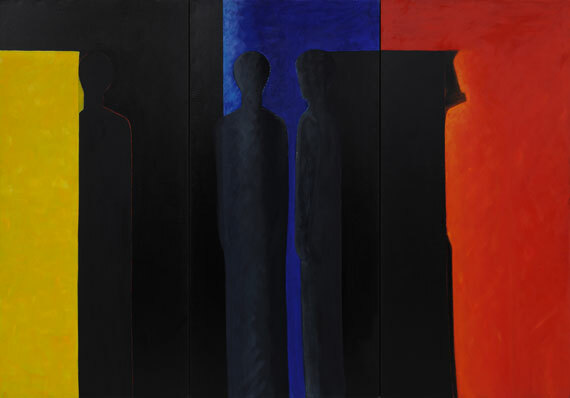 dass, die Zeit vergeht" (Waiting until Time passes), acrylic/oil on canvas, 200 x 1456 cm (to date), in black/white, is dramatically reduced, even radical in it's illuminated void, and yet filled with narratives. The confines of the canvas remain open, as if, year for year, new narratives might unfold.